Save Time & Money & Discover the Absolute Fastest, Easiest Way to Succeed in Real Estate Investing! You know, I wasn’t born a real estate investor. To get to where I am today took a lot of hard work. I experienced a lot of trial and error and I made a ton of costly mistakes. But I also did some things right. Now nothing gives me greater pleasure than helping others realize their real estate investing dreams – which brings me to why I created this Real Estate Learning Center. You see, I know how difficult it can be to achieve success and I also know firsthand just how sweet that success can taste once you do achieve it. That’s why I have created what I consider to be the ultimate membership website. 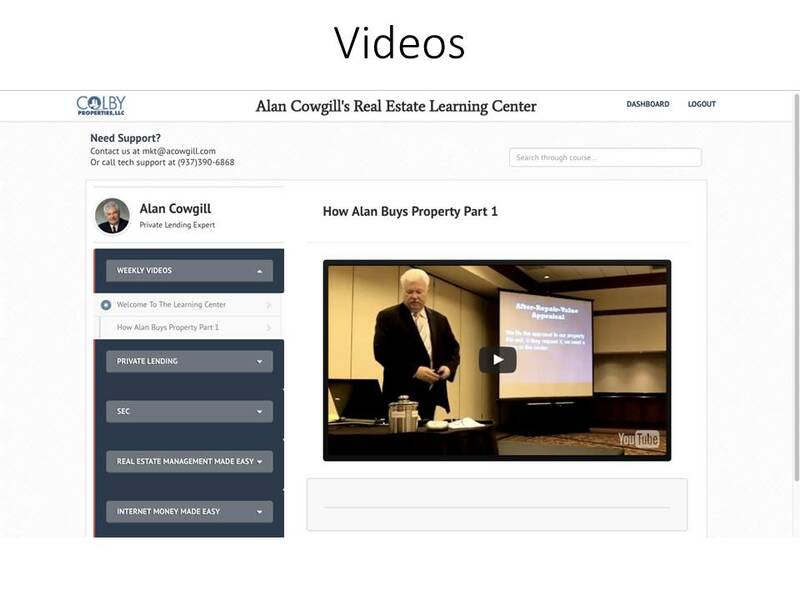 Once you join my real estate learning center, you will have access to videos, audios and written lessons and reports that include everything – all the tips, tricks and techniques – that I’ve learned over the years. From working with private lenders to dealing with the SEC, you will have everything you need. I’ve left nothing out. My goal in creating this learning center was to be honest and forthright and reveal what an investor needs to achieve success as quickly and easily as possible. Weekly videos covering a variety of important subjects from how I decide which properties to buy to what I’ve learned about staying on the right side of SEC regulations. And much, much more. Plus, a new video is added every week! Written reports and lessons on everything from private lending to real estate management and more. You’ll learn how to identify and attract the best private lenders, how to organize and grow your real estate business and much more. There is also information on how to make money on the Internet today – including how to build a profitable website. And you’ll also get an eBook each month containing tips and advice for achieving success in business and in life. No more frustrating Internet searches… no more being unsure whether a source is trustworthy or not. 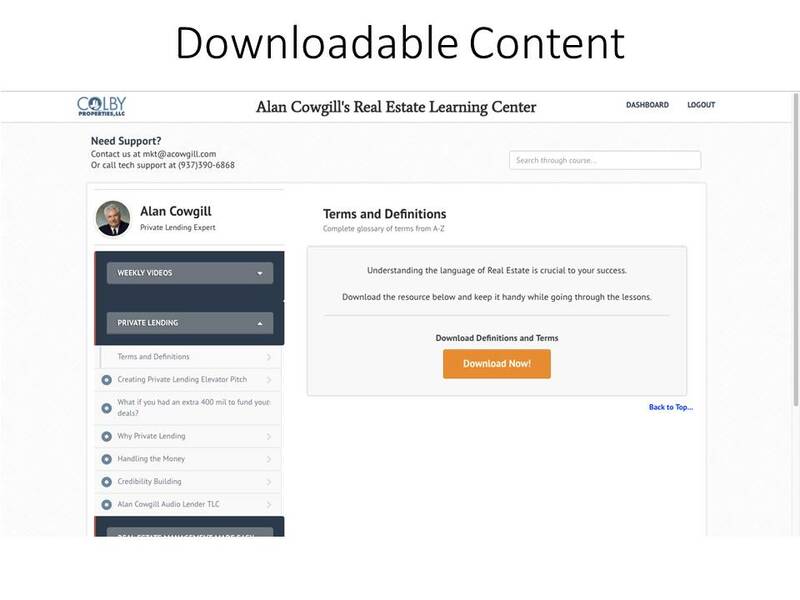 Here at my Real Estate Learning Center you have access to the very best of what I’ve learned during my real estate investing career – in multiple learning formats. Imagine when you have question, being able to log in and get an immediate answer. Imagine the time you’ll save knowing you can get the information you need at one convenient place instead of searching the Internet. Imagine knowing the best way to do something without having to go through costly trial and error yourself. It’s for these reasons, and many more, that I believe membership in my Real Estate Learning Center is critical to your real estate investing success today. 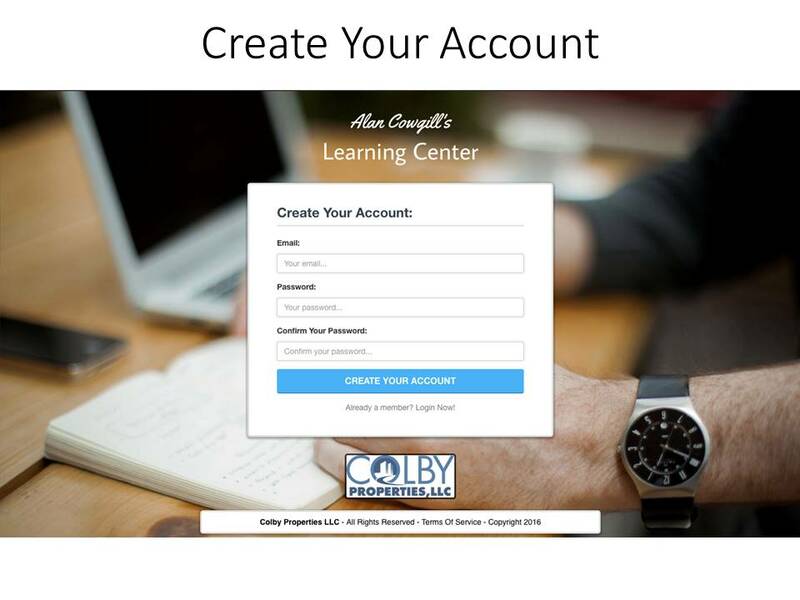 I’m also constantly adding new lessons to the center so that you can continually grow your real estate investing knowledge and achieve higher and higher levels of success. In the Real Estate Learning Center, you’ll learn the best way to do things so you don’t have to make the difficult decisions that side-track so many investors. The truth is, running a successful real estate investing business often requires you to make decisions that have a variety of possible results. This process can lead to “analysis paralysis” which is when a person has so many choices that they simply can’t make one. They spend their time analyzing and not taking action and that is no way to succeed. Chances are you’ll run out of money long before you figure everything out. To succeed today, you also need to know how to get funding for your deals. In the Learning Center, you’ll learn how to find and work with private lenders so you can make profitable deals without risking your own hard-earned money. The resources contained in this membership site will give you an amazing advantage over the competition and will put you on the fast track to success. Weekly training videos – these videos show you how select the best properties, how to get the money you need to buy those properties, and then how to sell the properties for big profits. You’ll also learn how to run a profitable real estate business, how to work with the SEC and much more. Unlimited access to written lessons, reports and eBooks – These resources are filled with tips and secrets that will decrease your learning curve and help you to achieve success even faster. 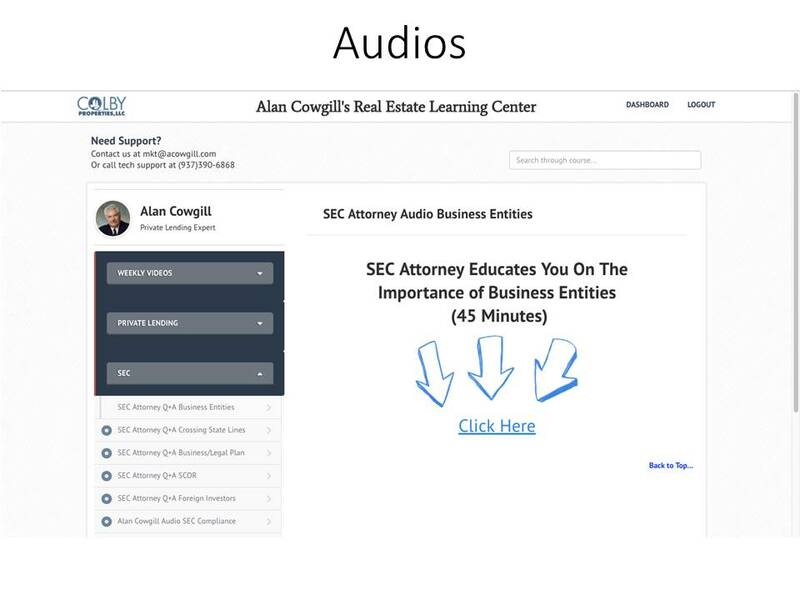 Audios – My personal SEC attorney tells you everything you need to know to avoid SEC fines – this may very well be the most important information in the Learning Center! Now, instead of being left on your own to put everything together, you can have unlimited access to all the tips and resources you need to succeed. Join Now & Pay Just $5 for the First Month! If you don’t find the information in the Learning Center helpful, you can cancel within 30 days and you won’t be charged any additional fees. If you do like what you see, simply do nothing and you will automatically be charged just $19.97 a month for continued access from then on. Pardon my language, but less than $20 for everything that you will have access to inside the Learning Center is a hell of a deal. But don’t just take my word for it, take advantage of the $5 trial and see for yourself. In the weekly videos, I share the most important things I’ve learned during my real estate investing career. I’ll share tips you can use to overcome challenges you are facing and to get the funding you need to grow your business. 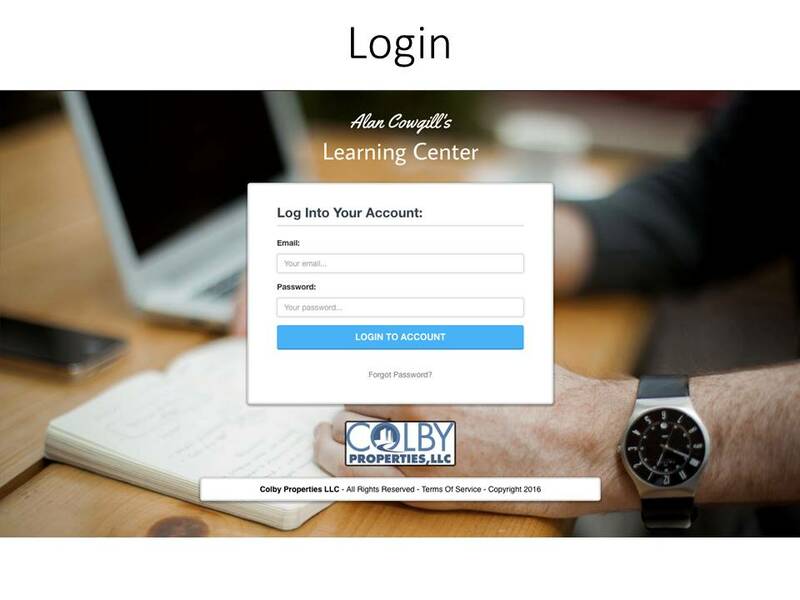 Sign up now for $5 and you will have access to the Learning Center for 30 days. If you decide it’s not for you, simply call or email us and we’ll cancel your membership immediately and you won’t pay any further charges. If you decide to stay, it’s only $19.97 per month and you can cancel anytime for any reason. You may never see an opportunity like this again. To be able to access the tools and resources that practically guarantee your success as a real estate investor and all you’re paying now is just $5? That’s basically unheard of. Sign up now and see for yourself what a difference access to my resources can make in your real estate business. the Best Chance of Success Today. Let me help you achieve your goals – become a member today! P.S. I’ve amassed a truly amazing collection of resources to help you – these are resources that reveal tips and systems that I use myself and that can really give you an edge when investing in real estate. Sign up now and enjoy 30 days of access for just $5. Happy learning!